The global challenges of our time are complex. Solving them requires dynamic, integrated approaches. As a leading academic institution with commitments to excellence in social science, natural science, and the humanities, Yale is well-positioned to advance innovative, multidisciplinary solutions. Among students and faculty, there is also growing interest in use-based projects and courses, and the University’s leadership has expressed interest in cross-department collaboration. Yale has over 4,400 faculty members and is home to a number of renowned research centers and institutes. Research at Yale pushes the boundaries of knowledge on topics ranging from energy solutions to global health. Yale Office of Sustainability is actively engaged in activities to promote the United Nations Sustainable Development Goals (SDGs). A research project explores how scholarship at Yale’s connects to the SDGs and maps the 4,400+ faculty members to the goals they support. Yale is also working in partnership with the International Alliance of Research Universities to investigate the role of academia in helping advance the SDGs. Urban@Yale is an initiative aimed at multidisciplinary scholarship and teaching on urban sustainability throughout Yale. It identifies courses and research projects around urban-related issues and promotes activities across disciplines. University participants include a variety of Yale College departments, the School of Forestry and Environmental Studies, School of Nursing, School of Architecture, School of Management, School of Public Health, Law School and School of Music. The Tsai Center for Innovative Thinking at Yale (CITY) has the mission to inspire and support students from diverse backgrounds and disciplines to seek innovative ways to address real-world problems. CITY was launched in Fall 2017, building a new center of gravity to help students, faculty, and alumni collaborate more effectively across disciplines, endeavors, and ways of thinking about the world. The Yale Institute for Biospheric Studies (YIBS) is the umbrella environmental science center on campus. It supports and inspires the environmental community at Yale through research and training, grants and fellowships, and weekly seminars and events. YIBS uses a collaborative and cross-disciplinary approach to study the entire biosphere: from molecules to landscapes, and everything in between. 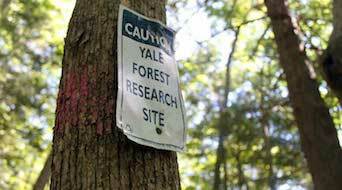 In addition to funding postdoctoral positions and the Edward P. Bass Distinguished Visiting Environmental Scholars Program, YIBS offers graduate student support to the Yale School of Forestry & Environmental Studies, and to the Yale Departments of Ecology & Evolutionary Biology, Environmental Engineering, and Geology & Geophysics. It also provides small grants for research affiliated with a wide range of Yale departments. Sustainability Enabled Exploration, or SEE@Yale, is a platform for publishing and disseminating student research on sustainability. Using EliScholar, a digital publishing platform available through the Yale University Library, it provides a repository for student, staff and faculty research on campus and New Haven area sustainability efforts. This allows students to determine what has already been done on a topic so that they can develop and pursue fresh and additive research projects. In recognition of student interest in transdisciplinary opportunities and learning beyond the classroom, all 6,000+ Yale courses have been reviewed to determine where sustainability content is offered, as well as which departments offer applied research, active learning, and practicum- and project-based courses. In 2018-2019, this will become an online resource that invites collaboration, highlights case studies, and offers opportunities for use-based scholarship.